If you want some co-operative action in the new Lara Croft game, your partner had better be in the room with you. Lara Croft and the Guardian of Light will launch later this month as part of Microsoft's Summer of Arcade, but it will missing its online co-op mode. Developer Crystal Dynamics says that the online co-op needs more time, and so the decision was made to remove it from launch and to patch it in later. 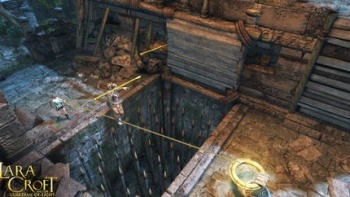 Crystal Dynamics' global brand manager Karl Stewart said that Crystal Dynamics didn't want the online mode to be the weak link that let the game down, and that while it was disappointing to have to hold the mode back, it felt that it was the best decision. The game's single player and offline co-op modes will be ready at launch, but the online co-op will added as a free update on September 28th, the same day that the game launches on Steam and PSN. Crystal Dynamics' decision might seem like a strange one at first, but it seems likely that it can't delay the game because of its commitments to the Summer of Arcade promotion. If that's the case, then none of the choices available to the developer were ideal, and it chose to try and give gamers the best experience it could. It seems like a pretty big gamble, however, to delay online play for such a long time. Lara Croft and the Guardian of Light launches on Xbox Live Arcade on August 18th.